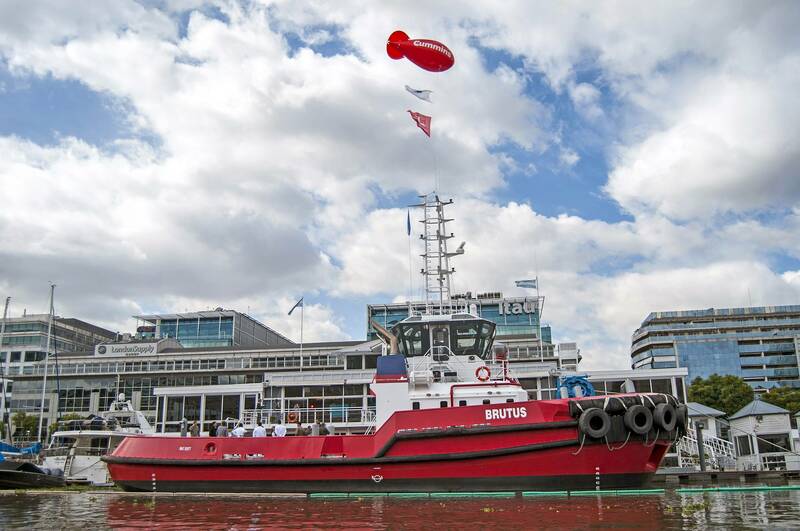 In May of 2016 the Argentinian-designed and built 28.77 by 10.2-meter ASD tug Brutus went to work in the harbor at Buenos Aries. This marked a milestone in Argentinian maritime affairs, as it is, at 5,400 HP, the most powerful ship-handling tug in the country. The tug was designed by Ing. Emilio Noël and built by Unidelta Shipyards S.A., which has a well-established reputation in a wide range of steel and aluminum workboats. The yard has a plant located in Buenos Aires with 10,000 cubic meters of open and 4,000 cu.m. of covered work space. The shipyard also has an engineering office located in the City of Buenos Aires. 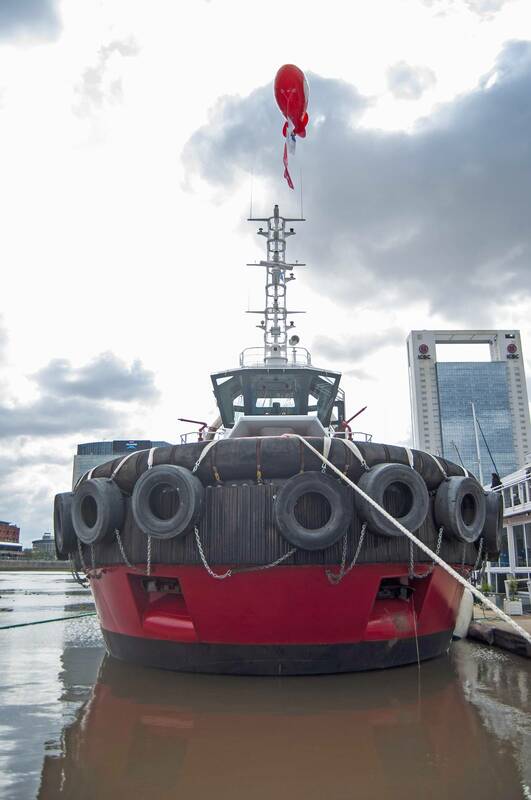 The new tug has joined a fleet of pilot boats and tugs owned by the SIP Pilotale & Practicaje, a firm providing pilotage in the Port of Buenos Aires and on the Rio de la Plata. The firm also has a Research and Training Maritime Center providing a wide range of trainings including the use of a simulator. The vessel’s 4.7 meter depth includes the two Rolls-Royce Azimuthing Thrsters, Type US 205/P20 FP. Each of these aft-mounted thrusters is powered by a 16-cylinder Cummins QSK60M diesel engine generating 2,700 HP (2,013 kW) at 1,900 RPM. With a design speed of 12-knots the 5400 HP tug delivers 75-tons of bollard pull. On the fore deck a combination Rolls-Royce Hydraulic Towing and anchor winch has been installed. 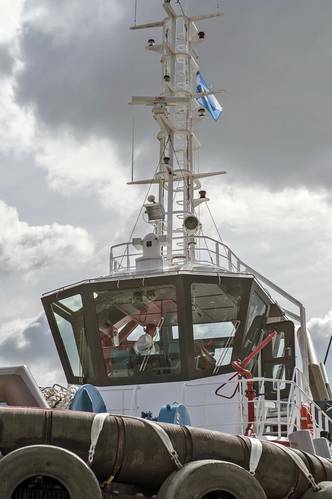 On the aft deck, is a Mapawey Quick Release Disc-type Towing hook, Type DCX50/65 with a 65-ton load release. Other aft-deck equipment includes a three-ton capstan. 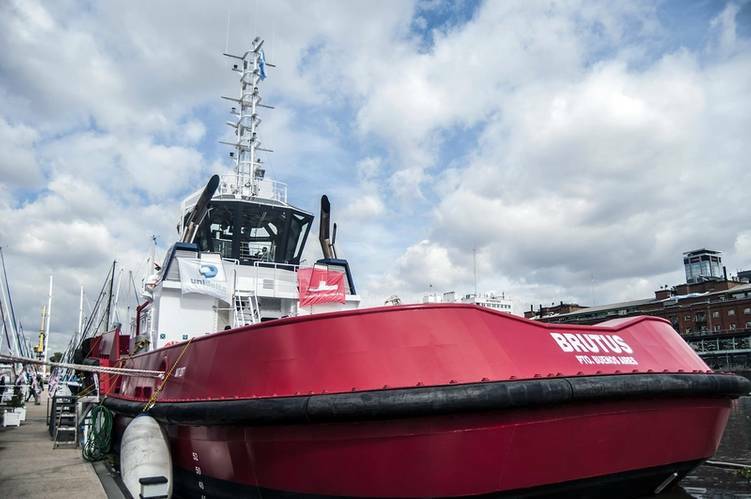 The tug is also fitted with a diesel driven pump-set powered by a Cummins 6BT5.9-D(M) capable of delivering 200 cubic-meters per hour to two monitors each capable of 100 cu.m. per hour. 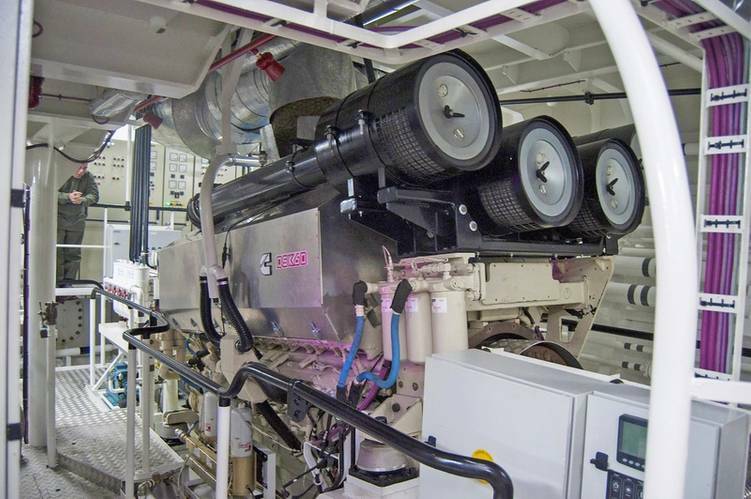 Two 80 kW gensets are each powered by a Cummins 6B-CP engine. Accommodation is provided for up to ten crewmembers. Tankage includes 107.4 cubic-meters of fuel, 15.8 cu.mt. of water and 6.5 cu.mt. of lube oil. The vessel is certified Lloyd’s Register Class Notation +100A1 tug / Remolcador de Tiro de navegación Marítima Nacional, Prefectura Naval Argentina.